The Resha name has been involved in sled dog sports since 1972. The evolution of sled dog equipment has come a long way since then! With new materials and training techniques, one thing remains the same...it's all about the dogs. Everything we make is geared toward the comfort and safety of the dogs. The philosophy behind all of our dog equipment is to keep it as simple as possible. Thanks in part to our own "research and development" kennel and input from customers we have streamlined the new catalog. We added some new products and discontinued others. 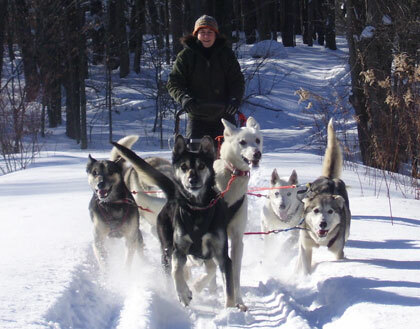 This unique sport of dog sledding has made it possible to enjoy an outdoor lifestyle. There is no greater reward than being able to work on a daily basis with these awe-inspiring animals. Their trust, friendship and loyalty are what this sport is all about. Resha Sled Dog Equipment provides sledding, freighting, weight pulling, ski-joring, dog sledding and working dogs products. We welcome newcomers and would be happy to answer your questions, and help you get started. If you’re a veteran or beginner, run one dog or a large team, Welcome to Resha! Copyright © 2019 Resha Sled Dog Equipment. All Rights Reserved.